Quantum chromodynamics (QCD) is the theory of subnuclear physics. All nuclear particles are made of elementary particles called quarks and gluons. The gluons mediate the strong nuclear force that binds the quarks together to form stable nuclear particles. The strong nuclear force is one of the four known physical forces, with the other forces being the electromagnetic force, weak nuclear force, and gravity. The strong nuclear force is also responsible for the interactions of nuclear particles and is, therefore, a fundamental area of study in nuclear physics. I currently hold a research position at Mines ParisTech/CRI, working on HPC topics and automatic code transformations. My background is a combination of mathematics and computer science. 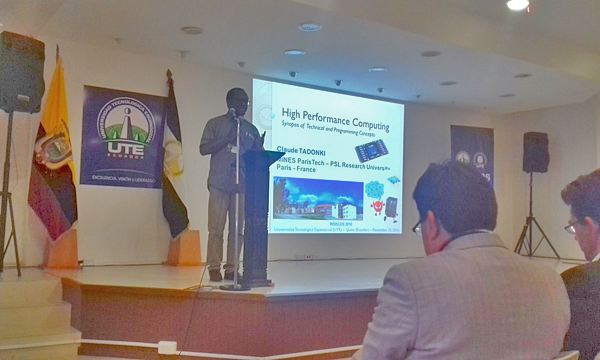 From my PhD and during my different positions afterwards, I have been involved in cutting edge researches related to high performance computing and operation research, following the sequence model, method, implementation. I am still interested in fundamental questions about difficult genuine problems, while striving to understand how the advances in optimization, algorithmic, programming, and supercomputers can be efficiently combined to provide the best answer. Harvesting the maximum from the HPC state-of-the-art is indeed my major concern (see my HDR report). If you are looking for a PhD opportunity (subject / grant / supervisor) in the area of HPC, please contact me.